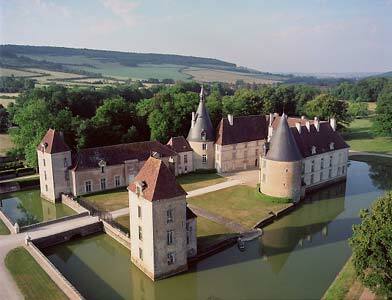 At the origin the castle of Commarin was a fortified house, as it was mentionned in 1214. The owners were from the first line of the Duke of Burgundy. During the 16th century the castle of Commarin has been transformed, its chapel decorated with an addition of statues, a number of paintings which have been made up for the owners, and the addition of superb heraldic and alchimy tapestries, made up for the Vienne family. During the 17th and 18th centuries, the castle of Commarin has been rebuilt on the fortified house and then furnished by Marie-Judith de Vienne, the owner and also gran mother of the well known Talleyrand. Her appartments are still intact. Magnificient stables were also built during the 17e and 18th century, as well as all houses and building around the castle. During the 19th century the French gardens have been replaced with a, English style parc. In 2004 a lot of trees have been cut for safety reasons, and the parc is now to be redecorated. The castle of Commarin has always been in the same family, with the 26th generation of the family owning it presently. It was also protected during the French revolution , so the castle of Commarin is a place of authenticity which still include the contributions made by all generations.